If you haven’t come across the word ‘hygge’ yet then where have you been? Pronounced ‘hoo-gah’, hygge is a Scandinavian concept that embodies the feeling of well-being brought about through warmth, cosiness, sanctuary and belonging. The kitchen, therefore, lends itself very well to this idea so this month’s Kitchen Trends blog is all about how to create a hygge kitchen. Soft shades work well to create a feeling of warmth and cosiness. We recommend soft pastel shades such as warm French greys, soft blues or even vintage blush pinks. A shaker style painted kitchen such as our Portland or Salcombe ranges work perfectly for this. You can introduce some texture and pattern through a tiled splashback but keep it muted; hygge is all about blending rather than contrast. For those not looking to remodel their kitchen, you can introduce these colours in wall coverings and accessories which will work great with a neutral coloured kitchen but harder to achieve if your kitchen is a strong colour. Hygge is about much more than what your kitchen looks like; it’s about bringing people together and creating a social space. If you have room in your kitchen you can achieve this via a kitchen table, island unit or even just a breakfast bar/seating area. Eating, cooking or baking together is a great way to create a sense of community in your kitchen so consider this in your kitchen design by having long counter tops that allow more than one person to share in the cooking or seated areas close to the prep/cooking area so that people can sit and chat with the chef. Nothing quite creates a feeling of cosiness quite like soft furnishings and textiles. It might be difficult to cram a big squishy sofa into the kitchen but you can certainly use textiles to good effect: blinds/window coverings, cushions on dining chairs and benches and even tea towels and aprons will all soften the space. Stick to Scandi-inspired colours and patterns and use soft fabrics – it’s all about appealing to all the senses so touch is very much a part of that. Lighting is often sidelined when designing a kitchen but it can make a big difference to the feel of the room. Brighter lighting may certainly be required in food prep areas but softer lighting is definitely more desirable for chatting over a slice of home baked cake or sharing a nice glass of something with friends and family. Make your lighting design flexible – have additional lighting options such as isolated spotlights or under cupboard lights in cooking areas that can be switched on in addition to other, more atmospheric lighting. Keep lighting low key in social spaces and consider other light sources such as lamps and candles to keep it nice and cosy. We’ve looked at the visual side and spoken of the tactile side of soft fabrics and textures but you can also really embrace hygge through smell. Cooking and baking smells contribute to the real feel of the kitchen so it’s good to incorporate appliances that really make this a pleasure such as a beautiful range oven (which you can get in various pastel shades), a semi-professional cooker such as a Neff Slide and Hide or even an Aga. Even counter-top appliances such as a coffee machine or bread maker will fill the kitchen with welcoming aromas. 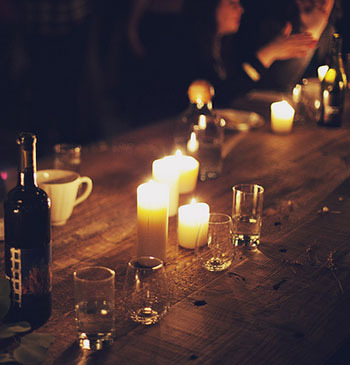 Aside from food, good use of scented candles will really add to the atmosphere too. We hope that gives you some good ideas for creating a hygge kitchen. We have lots more visual inspiration on our Hygge Kitchen Pinterest board so do take a look at that. If you’d like to create this feel in a new kitchen then we can show you lots more through a kitchen design consultation. Just give us a call on 0800 321 3491 or request an appointment here. 0 Responses to "Kitchen Trends Blog – February 2017"